Crouse-Hinds Myers™ Liquidtight insulated ground hub in natural finish, has aluminum construction for strength and durability. 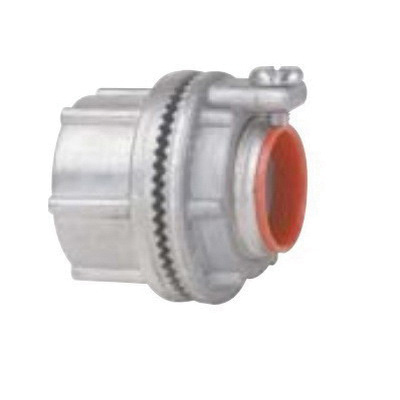 This ground hub with a trade size of 2-inches, provides both male NPSM threaded and tapered female threaded connection for tight fitting. It has Viton O-ring that offers excellent chemical resistance. It is perfect for use with rigid/IMC conduit. The hub is suitable for use in pharmaceutical, chemical and food processing, pulp/paper, nuclear, solar and commercial construction applications. Straight insulated ground hub meets cUL, E-59509, CSA C22.2 No. 18, NEC/CEC: Class I, Division 2, Class II, Divisions 1 & 2, Class III, Divisions 1 & 2, Class I, Zone 1, AEx e II, Class I, Zone 1, Ex e II, IEC: ATEX certified to EN60079-0:2009, EN60079-7:2007, and, EN60079-14, ATEX certified ITS12ATEX47591X II 2G Ex e IIC Gb Ta (-15 to 120 deg C), IECEx certified IECEX ETL 12.0009X to IEC 60079-0:2007-10, edition 5 and IEC 60079-7:2006-07, edition 4 IECEx-Ex e II Gb Ta (-15 to 120 deg C), NEMA 2, 3, 3R, 4, 4X and 12, IP66 standards.